Steve Gleason is a well-known figure in New Orleans, where I live. Gleason came to New Orleans from Washington State to play football for the New Orleans Saints Football team. Steve was small for a pro football player, but was known for his spirit, speed, and toughness. Steve retired from the Saints in 2009 to spend more time with his new wife, Michel. In 2011, Steve received the dreaded diagnosis of ALS (Lou Gehrig’s disease). This debilitating disease often attacks young people, and life expectancy is 1-5 years. Just six weeks after the diagnosis, Michel learned that she was pregnant. Steve and Michel were overjoyed at the news they were to be parents. But Steve also knew that he was unlikely to live to see his child grow up. So he began to record his thoughts to a video camera, so that his child would have something to remember him by. This video blog is the starting point for Gleason, an extraordinarily moving new documentary. Gleason chronicles the story of Steve, Michel, and their young son Rivers from 2011 to 2015. As Rivers grows bigger and stronger, Steve grows smaller and weaker, confined to a wheel chair, and largely unable to speak, except through the use of a computerized device. If this movie doesn’t touch your emotions, then nothing will. In New Orleans, Steve is very visible at events throughout the city, and is known for the establishment of his foundation, Team Gleason, which assists other families dealing with ALS. Steve and Michel have become an advocate for those suffering from the disease. Many Saints players, and other civic leaders, are supporters of Steve and his families. They have not forgotten their teammate. Some might think that the story of Steve, Michel, and their family, might sound terribly depressing. On the contrary it spans just about every topic and emotion you could imagine. Certainly some days are very difficult, both physically and emotionally. Gleason is especially sensitive to the strain on Michel. Like any mother, she spends a great deal of time and energy caring for her young son. But she also becomes the major caregiver to Steve. This takes its toll on Michel. One of the most compelling parts of Gleason is the relationship between Steve and his own father. Steve narrates that Mike, his father, was emotionally absent. He motivated Steve and his brother by fear. In addition, Steve’s parents divorced when the boys were young. Steve and his brother remember a period of constant fighting between his parents. In the years covered by the film, Steve interviews Mike on a few different occasions. There’s a real sense that these conversations on fatherhood, love, and faith are the most meaningful that Steve and Mike have ever had. The particular emphasis on faith is engrossing and heart-wrenching. Mike joins an evangelical church, and Steve cannot share his father’s faith. In an emotional exchange, Steve lets Mike know that he cannot accept his faith. Does this mean that Steve is not saved? Mike grows to accept his son and broaden his understanding of salvation. Rarely have I heard such honest, soul-searching discussions on the meaning of faith and salvation. You might be surprised, as I was, that the movie has an R rating. The rating largely reflects the use of profanity a few times during the movie. The rough language is not pervasive, and I think is honest. Dealing with such and intense emotions and physical pain, sometimes the feelings are expressed in language that isn’t nice. Throughout the film, the love of husband and wife, even under the very difficult situations, is amazing. Perhaps this film should be incorporated in the marriage preparation programs! Steve and Michel’s love for one another, for their son, and their family “in sickness and in health” is shown in ways that are touching, and also brutally honest. Many times we see Michel feeding both husband and son. Their courage and never-give-up attitude are very evident. As Dominicans, we say we preach with our lives, and so do Steve, Michel, and their extended family. In their decision to deal with the ALS as public people and advocates for others, they open themselves up to be witnesses to the world. You see how easy it would be for them to live their lives as very private people, and at times, they long for privacy in their struggle. But then they move on. The movie also has a sense of grace. We’d say that an athlete is graceful if he/she plays with a sense of agility, beauty, style, and love of the game. Even as Steve gradually loses his sense of physical grace and agility, he never loses his spirit, and, I would dare say he never loses his soul. In the midst of so many scenes is young Rivers, sitting on his dad’s lap in the wheelchair, as if this was the most normal thing in the world. 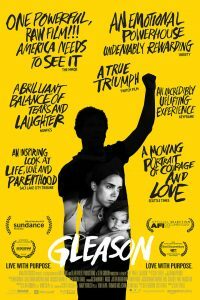 I doubt that Gleason will receive a wide theatrical release. However, its critical acclaim may allow a wider release than other documentaries. I loved this movie. It’s strong and honest and loving, without being sentimental and moralizing. I encourage you to see it, whether at the theaters, or in a few months when it becomes available for home viewing. It contains some profanity, which is the reason for its R rating. But the profanity is certainly not pervasive, as in many mainstream movies today.